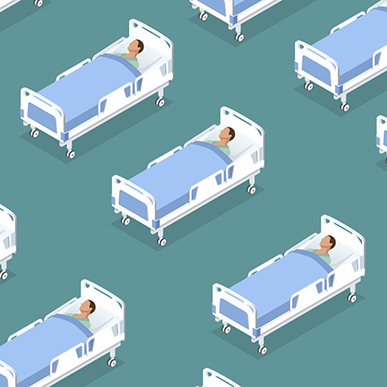 Delays in transferring patients out of hospitals to settings better suited to their recovery are a clear own goal for overstretched NHS and social care services. At Ipswich Hospital, now part of the East Suffolk and North East Essex Foundation Trust, things came to a head in late 2016: rising acute admissions left the trust with 80 patients in acute beds on its delayed transfer of care (DTOC) list. At 16% of the trust’s total beds, this was more than five times the national target. “Often, we could get patients medically fairly well, but if they remained in hospital for any length of time they would [deteriorate] and ultimately end up requiring significantly longer stays,” explains consultant acute physician Lauren Hoare. Moloney’s counterpart at the CCG, Richard Watson, says the need for “fundamental” change was widely recognised. “We kind of all put our cards on the table and had a bit of a heart-to-heart about how we all felt this problem needed tackling,” he recalls. The trust and CCG agreed a new funding arrangement up to the end of 2016-17. This replaced payment for activity or results with a guaranteed income contract which, says Moloney, effectively “gave us the incentive to seek to reduce demand”. The new, “transformative” approach took a forensic look at what lay behind problems and how the system as a whole was affected, in what participants describe as a genuinely collaborative spirit. It led to many, interlinked initiatives, some happening within the acute hospital and others in community settings and social care. Key features included improving discharge and assessment processes, increasing levels of support for patients to avoid admissions in first place or reduce lengths of stay, and extra investment in “re-ablement” and rehabilitation services to get patients home. The trust started working with three organisations – the Suffolk GP Federation, The Norfolk and Suffolk Foundation Trust and Suffolk County Council – to deliver NHS community services on a different model: as an “alliance” of providers. Moloney says this significantly improved the trust’s relationships with other partners and gave all parties a shared sense of responsibility for delivering commissioners’ “system-wide priorities”. Ipswich hospital, working with its alliance partners, reorganised its discharge process into a “Discharge to Assess (D2A)” model aimed at ensuring safe, effective discharge to the most independent living arrangements possible. This model involved ensuring each patient’s needs were identified at the earliest stage by multi-agency teams, or within A&E, then allocating them to one of four pathways backed up with dedicated resources. The trust realised, Moloney explains, that some patients were going home with care requirements that arose just from their stay in hospital; for example, patients who weren’t kept mobile in hospital might be prescribed community care services – some of which they ultimately might not need. “So we invested in support, in therapies and what we’ve called a ‘get up and go’ campaign within the hospital to make sure we were mobilising patients so they were not deteriorating and could leave without the level of support they might previously have needed,” he says. Under the trust’s model, patients assessed as needing re-ablement support in their homes are now supported for up to six weeks by joint NHS and council re-ablement teams. Managers have introduced what they call “tight oversight” of potential delayed transfers of care, with regular meetings involving key operational and strategic staff. Some patients who are unable to return home immediately now go to a community hospital designated as a ‘short term assessment re-ablement and rehabilitation service’ (STARR) for two-weeks’ intensive rehab under a consultant geriatrician and team of nurses, therapists and healthcare assistants. The local health and care system invested an extra £400,000 in this pathway. Others go for less intensive rehab geared to managing their long-term needs so that fewer patients require ongoing care in residential and nursing homes. Around £200,000 was invested in this. Another Ipswich initiative is so-called ‘Red to Green’ weeks, where hospital staff make intensive efforts to reduce the delays that hold up patients’ discharge. ‘Red Days’ are days where bottlenecks impede progress towards a patient’s recovery, while a “Green Day” is one where a patient receives every intervention they need, such as diagnostics or therapeutic support, within an expected time and delivered to set standards. Moloney says that trying to eliminate those Red Day that bring patients “no value” has motivated clinical staff to focus their energies on the support patients need “to get back to where we want them to be – which, ideally, is at home”. The trust has also tried to reduce demand directly by setting up a specialist assessment unit for frail elderly patients to provide an alternative to acute admission. In October 2017, Ipswich Hospital NHS Trust became responsible for services in three community hospitals and a range of community services. Managers and clinicians say acute and community services are starting to work as a single team with close links between community nurses and hospital wards and an increase in the capacity for social care assessments to be carried within the hospital. The “patchwork” of different initiatives for avoiding admissions that had evolved over time was “pooled into one team” and this has proved “incredibly useful,” says Moloney. Known as the Reactive Emergency Assessment Community Team (REACT), it operates round the clock and includes nurses, therapists, social services staff and carers. The REACT team receives referrals from GPs and ambulance staff for patients who have reached crisis point. Patients can be assessed in their own homes to see what services and support they need to prevent them being admitted. The team also assesses patients in A&E and can arrange the support that will allow them to be discharged safely. Hoare is clinical lead for the outpatients antibiotics service, which is administered by REACT and sends nurses out to patients who may need injections of antibiotics, for example. “It allows them to get back to their usual life and for us it’s a prolonged admission that we’re avoiding or significantly reducing - so it saves bed days and money and is better for patient care,” she explains. The results have been impressive in both quantitative and qualitative terms. On 1 February 2018, the hospital had just ten patients on its Delayed Transfers of Care (DTOC) list, compared with 49 a year earlier. Managers say the fall in DTOCs, from its peak of 80, has effectively freed up two wards-worth of extra capacity to treat those patients who “absolutely need” to be in hospital. Although Watson admits that a “plateau” of 16 to 25 DTOCs appears to have been reached – around 3.3% to 4% of the hospital’s beds – he says the next step is to try to hit a “stretch target” of 2.5%. The new Discharge 2 Assess pathways have produced an “encouraging shift of patient flows”, according to an interim analysis produced in December 2017, with a higher proportion of patients being moved out of hospital without the need for ongoing support. Overall, the trust recorded a 4% reduction in emergency admissions during 2017-18 compared to the previous year, and in the first quarter of 2018 there were 12% fewer admissions. Moloney says the biggest benefit, particularly over the last 12 months, has come from developing relationships with local partners to look at alternative models of care in the community and working with them to deliver a joint set of objectives. “Not only were we able to get through last winter reasonably well but we had fewer beds open this year than in previous years,“ he concludes. We look at how a team of managers, clinicians and QI specialists tackled the frustrating delays in treating hand injuries at Imperial College. Everyone wants to involve more clinicians in managing the NHS, but junior doctors are a notoriously difficult group to engage. Matthew Limb spoke to Imperial College about an innovative scheme that's already bringing results. With staff morale unnervingly low across the NHS, managers need to identify and resolve problems fast. We tap into one award-winning solution – Bristol’s ‘Happy App’. Recruiting NHS staff in London is tough, but managers at UCLH have found innovative ways to slash vacancy rates for nurses and midwives.